I actually read this novel earlier this summer and admittedly I am very late the review but it such was a long awaited read that it would be a bit of a disservice not to review it especially as it was for me one of several reading highlights of 2014. Readers expecting another multi-layered epic novel like Half of a Yellow Sun might well be a little disappointed. But don’t be. For starters Americanah is a very different kind of novel. I found it to be more of a social and a cultural commentary framing the central story of teen sweethearts, Ifemelu and Obinze. As the political situation in Nigeria worsens, having a knock on effect on students being able to complete their studies, Ifemelu encouraged by Obinze, leaves for America to study. Obinze plans to follow her at a later stage but American immigration policy gripped in post-9/11 anxiety, will not grant him entry, so instead he travels to London. The trajectory of the paths of Ifemelu and Obinze in their new respective countries are different yet strangely similar in that the root issue is the same wherever you go as an immigrant, an African one at that: Race matters! Ifemulu undergoes a painful time adjusting to life in the States, from the difficulties of finding paid work without the right documentation, sharing apartments with people who don’t understand you or your culture, finding out for the first time that you are’different’ not just to white Americans but to African Americans, to and this being my personal favorite, discovering the politics of Black hair: To straighten or not to straighten, weaves, braids, natural fros all take their place in determining a Black woman’s place in the US of A. Eventually she finds her feet and begins to blog about her experiences and observations as a ‘non-American Black’, later garnering respect, admiration and perhaps some level of jealousy from her peers. In short, Ifemulu finds a way to embrace the American dream and make it her own, or at least make it work for her. Sadly no such dreams are to be found in England for Obinze. The undocumented life takes its toll and eventually a desperate decision finds Obinze back in Nigeria trying to start life again. Years later, the two are reunited again in a newly democratic Nigeria. Obinze has become a wealthy businessman, and Ifemelu is blogging once more this time about the experiences of being a ‘returnee’. This part of the novel I really liked as Ifemelu identifies how adjusting and adapting to a place you once called home is not easy. Having lived in the States for several years with a keen sense of unbelonging, in theory returning to live in Nigeria should have been easy. But life isn’t straightforward and being back in Nigeria only serves to highlight Ifemulu’s ‘otherness’ in her own country. It also showed how much both she and Obinze had changed as individuals, the only thing remaining the same being their love for each other. 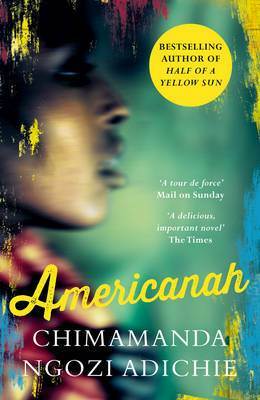 Americanah, as with all Adichie’s novels is deliciously gripping with just the right level of drama and realism. The love story underpinning the social commentary of life in London, the US and Nigeria carried me along as I wondered what the future for these two lovers held. Its also a novel that gave me pause for thought as Adichie’s sharp observations on life in three very difference countries rang a bittersweet truth for all to hear. Posted on 30 December 2014 15 March 2018 by queenpea77Posted in ReviewsTagged African literature, feminism, fiction, identity, just-read, langauge, race, women. Hi and a Happy New Year! Long time no see. I have this book as my yet to read but it has not happened as yet. But after reading such a great review, most definitely, before 2015 comes to an end, I must read it and know that I’ll receive the same amount joy you received. Take care and have a great year. Hi there! Happy New Year to you as well. It has been a while but hoping 2015 is lot more productive! Here’s to a great year ahead and great reading. Take care of you too!